The Thompson Mk3 Bandsaw offers a Reliable Smooth Cutting Operation delivered by a direct drive motor system. The direct drive motor system also provides positive and constant blade speed and eliminates the requirements of frequent adjustments and replacement. It is constructed from High Quality Stainless Steel and offers many features normally associated with more expensive machinery. This is a very popular choice of Bandsaw in butcher shops and supermarket facilities. The Thompson MK3 Bandsaw has fully integrated safety systems including brake motors. Brake Motor which allows the blade to stop within approximately 4 sec when stop button is activated. This minimizes the possibility of accidents caused through blade run on. Purpose Designed Heavy Duty Tinned Wheels with Safety Flanges prevent the blades from dislodging when cutting greasy wet product, eliminating possibility of operator injury. A Powerful 1.5 kW 8 Pole Motor ensures continuous smooth cutting operation through products. 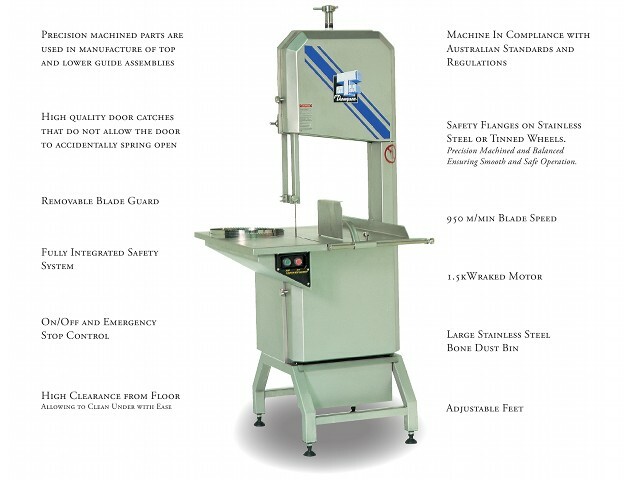 Limit Switches on both top and bottom doors ensure that bandsaw cannot be accidentally started during and after cleaning operations eliminating operator injury. Limit swicthes are internally wired to improve the safety, hygiene and appearance. Bottom Wheels are fitted with taperlock housings for easy removable and it cannot become seized on the shaft throughout the life of the machine. Quick and simple disassembly ensures ease of cleaning. High quality Electrical Components used in MK3 Bandsaw are rated above standard design requirements to ensure longer life and reliability in harsh environment. Stainless Steel Wheel Scrapers are fitted to reduce product build up between the wheels and blade.